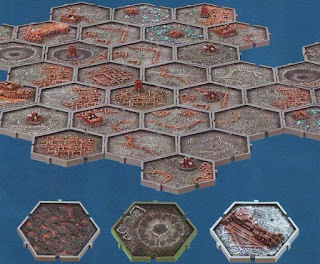 This has nothing to do with Col. Corbane's Going on Campaign blog (though it's a great site for reference material and advice, you should have a gander if you get the time), but a Planetary Empires campaign that will be taking place at the club I attend, starting 4th February. We'll have about fifteen players and it's looking to be a two-month/eight-game campaign with the one who has the most territories. I thought I'd post up the rules ahriman sent me (he's organising it) in a preliminary format and see what you guys think of it. Welcome to the Barming Wargames Club’s 2010 campaign. Enclosed you will find the general guidelines for selecting an army and aiming it towards Glory! All official Army Codices are accepted for use, as well as additional rules for units from the Imperial Armour books. The official Start Date of the Campaign is Thursday 4th Feb.
Before then it is advised that you agree who you will be facing off against for both week one and two. In fact planning two weeks ahead will give you, the player, a much better chance to plan your list and deliver to your opponent a swift kicking… on the battlefield.. Contacts for all members of the Campaign will be provided – so please keep the list safe. The Planetary Empires Campaign Rules are all in full affect, this means that all players will be randomly allocated _ tiles at the beginning of the campaign, and your main objective will be to create a stranglehold on the surrounding territories. What type of mission you play is left totally up to you and your opponent to agree: i.e. planet strike, cityfight etc. can all feasibly be done- The Campaign will be deliberately left open for you and your opponent to choose what sort of game you wish to play. You are free to use them in your games, however should you accidentally (or deliberately) get Him/Her killed then you cannot use them for the rest of the Campaign. (The only possible exception would be Lucius the Eternal). However, as this ruling may turn out to have a negative effect on the armies players are able to field, the restrictions for things such as Chapter Tactics and Special Rules Concerning Force Organisation Modifiers are lifted. So for example if you were planning on taking a Salamanders Army, and you accidently got Mr. He’Stan killed last week, fear not as you can take a normal HQ choice and still receive the bonuses he provides in his Special Rules for Chapter Tactics. I'm very glad for that last rule concerning special characters, as I'll be using a Wolfwing list for this... I'm going to propose that Special Characters that were taken out of action during a game receive a 4+ roll to see if they survive their injuries and return to battle (maybe missing a game). I think this reasonable as removing a model from the board is not necessarily indicative of someone dying, just being out of the battle for the 10-20 minute duration the average game represents. (If you're reading this ahriman, and I haven't sent you the e-mail, I probably forgot... :D). I'm also not sure on the win-loss % as a tie-breaker, due to the low(ish) number of games meaning that if you miss a week or two, you could be seriously handicapped/advantaged depending on the situation (as each game will count for quite a high percentage). So, I've been making a piece of terrain, using vac-formed plastic from Amera Plastic Mouldings over the last week for our club session tonight. The club has a scheme going where one painted piece of terrain to add to the inventory = 1 free night of gaming. I, being me, left it until the last possible minute, of course. So, Monday night, I mounted the building on an MDF base (kindly cut by Zygx, over at 7th Day of Creation (TIP: Get a friend, or yourself, on a model-making degree - very handy... :D)). I had to add lengths of sprue to the base so as to obtain a greater contact area, then just added superglue. I also added a few brocken up blocks of expanded polystyrene to serve as rubble at the ruined end of the building. I stuck them on with superglue. Once all that was done, I came back to it the next day (got a bit bored with it and wandered off that night...), spead a generous amount of watered PVA down on the board itself, the polystyrene (made sure I covered the whole thing) as well as selected bits of the building itself and stuck some (unused) cat litter on there. Left that for a good eight hours then came back to it and added another layer of watered PVA over the top (dabbing the brush so as not to dislodge too much of the stuff) - I literally drowned the thing, as I do with my Imperial Guard bases. Left that until the next night, made sure it was all dry, and started priming - thinking that the two layers of PVA and the cat litter on top of the polystyrene would protect it. Luckily for me, it doesn't look too bad - mainly because there is cat litter literally all over it (though it was frustrating dabbing black into all the recesses). As it stands, I've just got to drybrush the rubble area (was still waiting for the black to dry last night) with codex grey, then a lighter grey drybrush all over when I get home tonight. All that just to save £3.50... Well at least there'll be an extra piece of terrain for the club, which is always good. http://www.thepalantir.org/ca/terrain/azo001/azo001.htm - this article suggests the use of a sand/PVA mix, which, I would assume, would protect the foam from whatever is in the spray primer better, as well as disguise the bubble-like texture it has. He doesn't use spray primer here though. Some very nice rocks, too. Oh, and a quick question: If I try and spray varnish this thing, will that melt it as well? 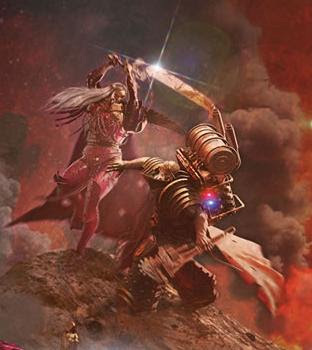 Image from Games Workshop - used without consent. 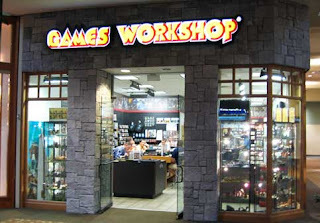 I was walking past my local Games Workshop during lunch today, and realised that I hadn't been in there (in a buying capacity) in quite a while. I came to the further realisation that I had no reason to do so... I just don't shop there anymore. I used to spend quite a fair bit of my money in there each month, but I think that had more to do with the fact that I didn't have the internet and the store was literally around the corner (I miss the 2-minute walk to work...). We don't even have what you could call a FLGS in our area that could be sucking away my business. The closest one that I know of is in fact in Aldershot, about 2 hours drive away (it's called The Games Shop, and if you're in the local area, is well worth checking out). The main reason I don't shop there is probably the internet. Try Wayland Games, for example. Even with shipping, you still make a saving on full GW price, and it's delivered straight to your door - you don't have to worry about all the pikeys giving you weird, calculating looks on the bus before you get your new purchase home. Then take Bits and Kits or BitzBox and suddenly, the lack of a meaningful bits service from GW doesn't matter so much anymore... and you have even less reason to go in there. Another reason I used to go in was just for a chat with some of the staff (back when I knew some of them). They'd fill me in on news and rumours and I'd come out looking forward to purchasing something in the not too-distant future. Since my access to such information has greatly increased, again, due to the internet, I find myself seemingly knowing more about what's coming up than the staffers do themselves. Well, either that or they're all playng the ignorant. I'm now also part of a gaming club that meets weekly - so I'll be getting regular games in with no need to attend "veterans night". Do you still shop in GW? Why? Have the staff in your area made it a really great place to be? Or do you have no other choice? Is it just the most convenient place to go on your way home, or would you go on a mission to Town Centre specifically to go to the store? Sadly, there's not much hope of a camera coming on a permanent basis any time soon - new TV trumps it. I'll try and have the other half bring her camera down at the start of february - she'll be staying for the week, so expect plenty of juicy piccies around about then... You'll just have to make do with my random maundering until then. The plan is to take a squad at a time, between my other projects, and get them done completely before moving on. There is no hurry, as I have the Morlocks to game with in the meantime anyway (not that I get that many games in anyway... I should probably add that to the "Intentions"...). The razorbacks will be represented by old-style predator conversions. The ones with the thinner turrets that are mounted forward on the tank. Part of the Predator back story mentions that during the Great Crusade, it had a small transport capacity which was eventually substituted for more ammo. 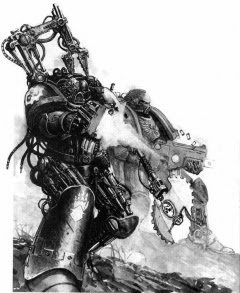 I left special weapons off the assault squads because flamers reduce the number of attacks you put out (especially when the squad starts to get whittled down) and the lack of jump packs means they don't have the mobility I would want for a horde-thinner unit. The plasma pistols are just too damn expensive. The sergeants do have specia CC weapons though. I have to say, I'm not used to using Rhinos. The idea of getting out of a transport and just sitting in front of someone - especially orks - just begging to be assaulted is a bit nerve-wracking, but I'm hoping that an anvil-and-hammer approach to this will work (fingers crossed!). When I find time to scratch some cheap drop pods, I should be able to switch out the Rhinos and end up with a drop-pod army (though I'm not particularly sure how effective that would be...). So what do you think? Any suggestions on potential weaknesses that I need to look out for? With no work to keep me busy, and no piccies to show you, I thought I'd show you a list I wrote up the other day (during another slow period), to represent part of the Morlocks deploying on Istvaan V to crush the Warmaster's rebellion. 3000pt Planetary Assault List, Iron Hands (Space Wolves). Right, so that's 9 Drop Pods, 5 of which are armed with Deathwind Launchers, 3 of which can be assaulted straight out of (the dreadnoughts). You may think that everyone seems to have a lot of wargear - which would be true. Within the limitations I set myself, there is literally not enough space on the Force Organisation chart to fit more stuff in... 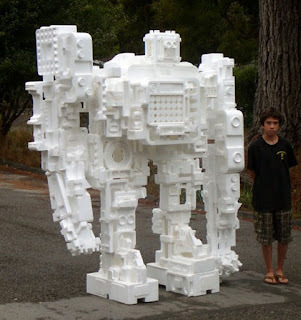 Hence why every Dreadnought is venerable and has a Lucius drop pod (not that I mind, of course! :D) and Gabriel has a wolf tail talisman. I left the terminator squads mostly intact from my "normal" build. They're versatile and can deal with most situations with a reasonable spread of re-rolling wounds/hits, S5 power weapons, S6 Rending and S8 Calm-Downs. I did add a couple of Cyclones to two of the squads (basically replacing the flamers), which should, along with the TLLC dreadnought, help against the heavier armour while the standard squads and two other dreads deal with the transports and their squishy contents. Hope you all had good holidays and all that shebang. Just thought I'd give you guys a quick update as to what is going on. So I went on about intentions in the last post - and I'm glad I did... I've gotten absolutely no work done on the Morlocks since that last post, and probably won't for the next week or so, mainly due to the package that came to me on Christmas Eve, holding a nice shiny Land Raider Crusader/Redeemer which I'm currently at work pre-heresy-fying (first new term of 2010! :P).